I hear that taxi receipts are going to be emblazoned with advertising soon. In theory, that passes the laugh test, no? For anyone who has ever been handed a mangled 2-inch receipt with blurry ink, it sounds ridiculous. Unless it’s an ad for a better receipt mechanism, we might want to rethink this initiative. Advertisers for the most part are hitting the right note in placement. The industry has matured and is adept at following (and even predicting) trends. Traditional platforms are still in the game, but new media has prompted creative delivery initiatives. With our hand-held devices, web-based platforms and the like, we are bombarded with new forms of ads. Only the most rural of us leave our homes without entering a technicolor world of advertising. Those taxis about to get the smudgy receipt ads? Most of their roofs are festooned with a large (illuminated) table tent of an ad. Almost all cabs now have advertising (posing as network news) playing on a monitor in the backseat. There really isn’t much to malign about the ubiquity of advertising. If it hurts anyone, it’s the product/client not the user/consumer. How in the world do you make yourself heard above all that noise? One of the oldest ways to get noticed is celebrity endorsement. Since there were celebrities there was celebrity endorsement. If anyone had thought to market apples, I’m guessing they would have approached Eve. Throughout the years most endorsements and advertisements have been quite obvious. But what happens when advertising not only becomes more ubiquitous but more embedded? What happens when a celebrity is famous for selling themselves as a brand (versus being a performer?) There is a potential for conflict of interest as well consumer confusion. Users/consumers are becoming increasingly inundated with advertising, and may be a bit numb. A million years ago, the novelty of Judy Garland selling Max Factor was so unique the consumer would think; “Look it’s Judy Garland selling Max Factor!” (and most fans knew that Max Factor was the make-up artist for the movie studios.) Now that everyone is famous and ads are everywhere, being intuitively savvy is a challenge. The harm is not to the product or advertisers but to the consumers. Regulating advertising to protect consumers is not new. You may remember when some paperback books had full-age cigarette advertisements. Liquor and cigarette advertisements were once on television all the time. Public health concerns change over time and in my estimation will always trump profit. A simple black box hurts no one, not the product and not the paid spokesperson. All it will do is remind the consumer that they are in fact experiencing an advertisement. Have we all heard just about enough about the dangers, both physical and evolutionary, of texting? Do we need another article haranguing against smart-phones on dinner tables? Isn’t it crystal clear to us all that “living in the moment” is now only a behavior for which we pay thousands of dollars to experience in a spa? Technology has changed our orientation to the world around us. But I don’t particularly care about all that right now. What I do care about is personal phone calls at work. (Quaint, isn’t it? 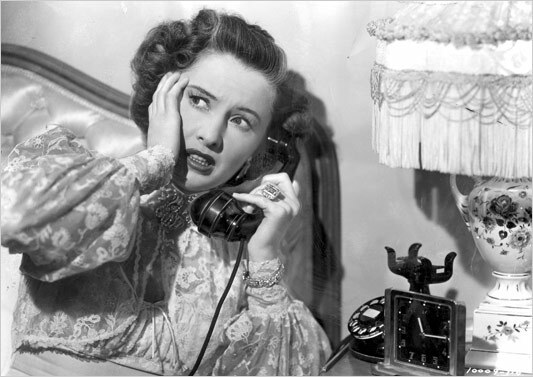 That sentence conjures up visions of Judy Holliday at the switchboard.) For reasons which allude me, the technology of a “phone call” has obscured the intent of the call. The fact that people needn’t speak to communicate, or use a telephone belonging to an employer, seems to have blurred the lines for many. Show of hands, how many times has the clerk at your checkout register been tapping his/her acrylics onto a phone? Have you ever entered a boutique and not heard the shopkeeper on a personal call? The last time you frequented a restaurant with a host/hostess, were they looking down and squinting, behind their station in the dark? There are work situations in which personal communication is not only permissible, it is probably encouraged. I was recently on a film shoot at which the principals (waiting upwards to 15 minutes between takes) typed away, happily passing the time. But those particular employees were not actually working while making their personal calls. Their attention was not expected to be anywhere but on themselves. Now here’s where the rant builds up steam. I have lost count of how many of New York’s finest I have seen texting or making personal phone calls while working. I suppose the traffic officer would argue; “Hey, I can give tickets and text at the same time.” Perhaps, but you’re in uniform and; a) it is unseemly to be engaged in personal activity, and b) you are an officer, and if you’re not seeing something and saying something, why should I? I have also seen “beat” officers, standing and texting on a corner, officers in squad cars (thankfully, the passengers not the drivers) texting as well. Now unless that is how the police department now communicates with its officers (and for all I know, it is) I find this truly distressing. I am a feminist. I do not waiver pronouncing that fact, and do not understand people who do. “Well, I wouldn’t call myself a feminist, but I do enjoy the right to vote, work, control my fertility, etc.” Good G-d, just say you’re a feminist. It’s not a dirty word, and it is not synonymous with man-hating. But I digress. I believe that women are much more than the sum of their parts (augmented or otherwise.) At times, I have resented the male to female reassigned peoples that equate womanhood with wearing make-up and high heels. I am about as femme as they come, but it is a choice not a condition of my gender. I doubt the gender-physicality phenomenon will ever be anything other than unequal (on the screen and on the streets.) It’s just not how we are wired. One need only walk through an art museum to be reminded that this disparity is not a new phenomenon. Women (for reasons I won’t attempt to argue) have always been the preferred vista. Personally, I have made my peace with this situation. For quite some time actually. I believe it all balances out. I don’t take any particular pleasure in pointing out that (socially) men often get the short end of the stick. Women have far more freedom in expressing themselves. We have latitude in our attire (if you don’t believe me, try to remember the last time you saw a man going to work in a dress.) We (mostly) walk through life with an air of perceived innocence (has anyone ever looked askance at a woman alone in a playground?) We are not viewed as undesirable dating material because we a) don’t have a degree b) live with our mother or c) don’t own property. We are expected to express ourselves emotionally and physically, and might even live longer for doing so. For me, the social benefits of my gender far outweigh the physical bias. I have no issue with the fact (yes, it is fact) that men and women differ biologically. Having differences is not a license to be treated differently however. I enjoy and expect equal rights. I have not a doubt in the world that many many will take issue with all I have expounded upon above. (Some) women in particular, are very angry at having their appearance be acknowledged in any way. It’s not a constructive use of anger. We live in a world of mostly sighted people. Like most mammals, we use our sight to learn about others and our environment. 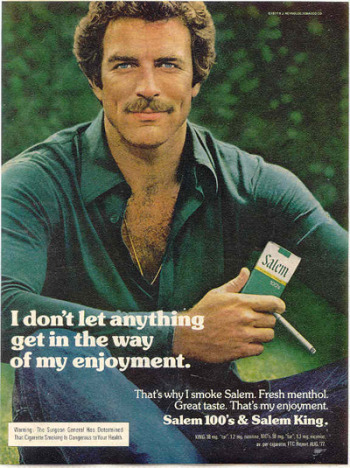 So as I age, and hopefully I will, I accept that unlike Mr. Tom Selleck, I may not become increasingly dreamy. As long as I also get to chide people for cursing (in public) with impunity, talk to unknown small children without being mirandized, and hug and kiss my friends in public without notice, I’m not complaining.